Automation of redesigning (regrading) the vertical alignment of a surface based upon surveyed points or known differential values. During the process of construction, it is not uncommon that a proportion of the surface does not meet the final design (tolerances) or specified minimum layer thicknesses. In such circumstances, it is possible that the contractor may incur a penalty for being outside specifications, or have added costs in materials for rectification. It was with this in mind that LendLease (then Abigroup) first developed a spreadsheet that allowed semi automated regrading to conform to RMS (previously RTA) specifications. The spreadsheet worked well for providing a solution to the regrading of a surface, but required many steps to calculate values, as well as an innate knowledge of the regrading process to ensure errors were not overlooked. Another macro was developed by an external source that was also semi automated and required many steps to provide a suitable outcome. As 12d Model software was already in use by the survey department across Abigroup as a whole, it was decided that the only way to improve and standardise the process was to provide an ‘in house’ solution that manipulated the data directly to and from 12d Model in a manner that suited their requirements. This also meant that it could quickly be distributed across the company with very little training due to the familiarity of 12d Model. 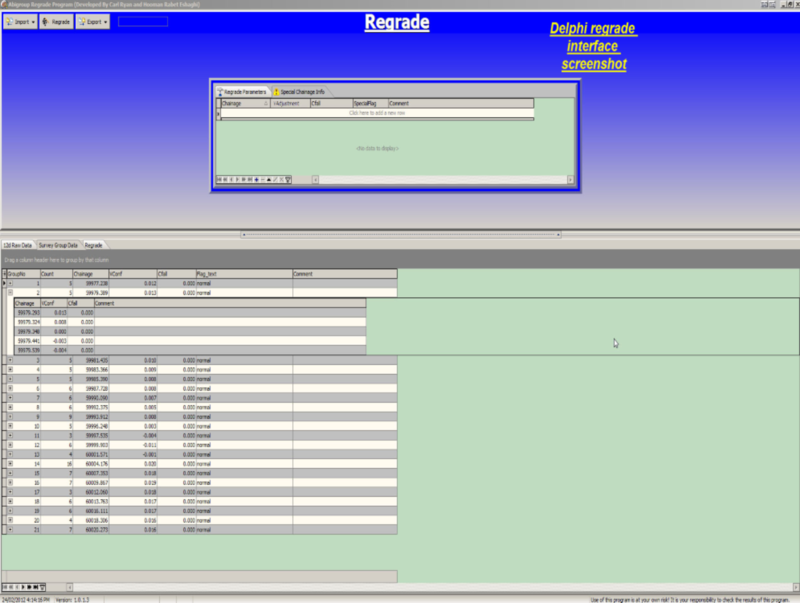 12d Model software was employed as the main component of the regrade program, with support from the Embarcadero Delphi programming language. A 12d Model macro was written that would accept the survey data and provide conformance information. This information, combined with the design data and user selected criteria (e.g. ride quality and thickness), was passed to the Delphi module, and the regrade function them took place. Users could specify fixed locations within the data (such as bridge abutments or existing tie-in points) and decide upon the vertical rate of grade change allowed. The program combined the data and the parameters and through an iterative process produces, within 12d, created new design strings to satisfy all criteria. If satisfying all criteria was not geometrically possible, the user was notified and could then choose to modify or accept the input information. It is vital to maintain traceability of data; therefore user parameters such as lot number, user, date/time of regrade, original z value and comments were passed from the Delphi module to 12d Model and saved within the new design strings as attributes. The interface of the program is very user friendly, and for an experienced Abigroup 12d operator posed no problem with either data input or assessing the results. The development of this powerful program greatly reduced the time taken to regrade a surface. It provided Abigroup with cost and time savings, as well as increasing the quality of the finished product for clients.